Cacioricotta del Cilento: Cilento has a lot of pastures for the goats herds that can graze and feed on grasses and shrubs typical of the Mediterranean area. The Cacioricotta is a cheese produced from their milk and it is a deliciousness that can be consumed sliced with honey and bread or, if aged, grated to enrich the pasta with tomato sauce. The Cacioricotta is produced throughout the year, so do not worry, you can always find it! Soppressata di Gioi: Gioi is a little town in Cilento and the soppressata is the typical salami here producted. It is made of minced pork leg meat, salt and pepper, with a long lard strip put in the middle. The soppressata can be eaten sliced with bread and often it is preserved in extra virgin olive oil, to allow the meat to remain soft even after a long time. Alici di menaica: this is a typical product of the clear blue sea in Cilento. Here the fishermen tradition is ancient and still survives strongly. These anchovies are caught between April and July, with low nets which catch only the big ones. You can enjoy the menaica anchovies in typical Cilento preparations as “alici ammolicate”, seasoned with breadcrumbs, garlic and parsley or “inchiappate”, stuffed with goat cheese and eggs, fried and then cooked in tomato sauce. Olive salella ammaccate: Cilento is the land of olives and good oil. The olives of the ancient varieties named Salella, here undergo a very special treatment. The fruits more pulpy and still not mature are collected and are dented one by one with a stone of sea. 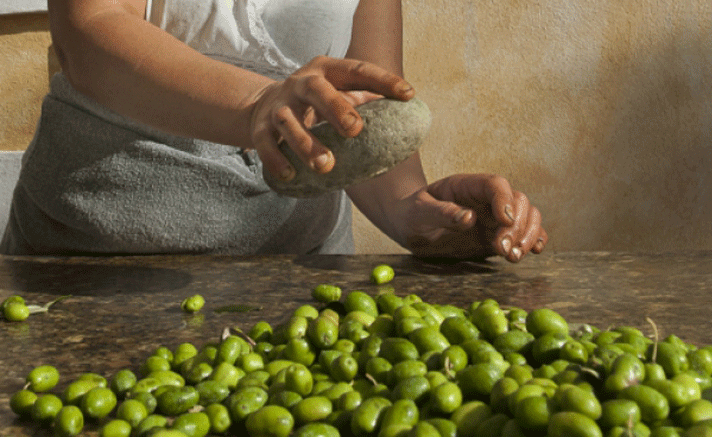 Once pitted, the Salella olives are immersed in brine and preserved, then, under oil. The final product is a perfect result, the fruit of patience and expertise of Cilento farmers. Fichi dottato del Cilento: we conclude with a typical sweet product. White Cilento figs are picked between August and September and then left to dry in the sun or passed in the oven. Once ready, they can be enjoyed raw or “impaccati”, stuffed with walnuts, almonds, citrus peel, or covered with dark chocolate. A real treat to round off your trip to the land of the sun.